BoxBlur: Applies a simple and efficient blurring technique in which each pixel in the blurred region is calculated by averaging its neighboring pixels in the input image. 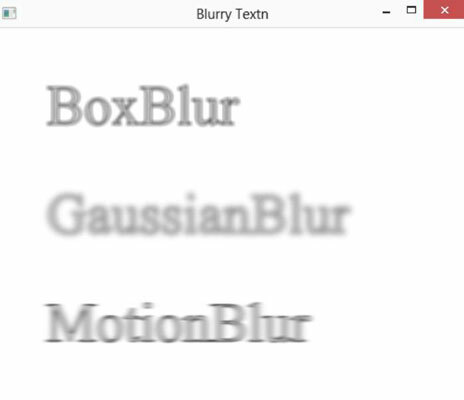 GaussianBlur: Uses a Gaussian blurring algorithm, which is more accurate but less efficient than a box blur. MotionBlur: Blurs the shape directionally, creating the effect of motion. This table shows the members of the three blur effect classes. BoxBlur() Creates a new BoxBlur effect with default settings. GaussianBlur() Creates a new GaussianBlur effect with default settings. MotionBlur() Creates a new MotionBlur effect with default settings. void setHeight(double value) Sets the vertical size of the blur effect. void setWidth(double value) Sets the horizontal size of the blur effect. void setRadius(double value) The radius of the blur effect. The default is 10.0.
void setRadius(double value) The radius of the blur effect. The default is 10. As you can see, default values were used for each of the blurs. If you wish, you can use the methods listed in the table to tweak the appearance of the blur effects.